Shuffled spaces — and a few smart additions — buy an active family a wealth of functional room in their Clayton home. 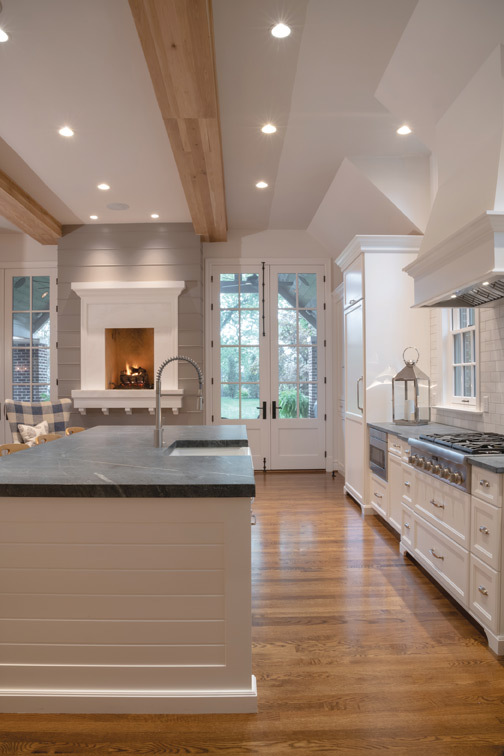 Un-oiled soapstone lends a softness to the larger, remodeled kitchen. What was once a covered porch is now Jean’s airy home office. A restructuring of the main story and the addition of tall windows by Pella Windows & Doors allow light to pass through the entire floor. Original windows remain in the 91-year-old Clayton residence. The architect created a back entrance for the homeowners near the kitchen and family room. 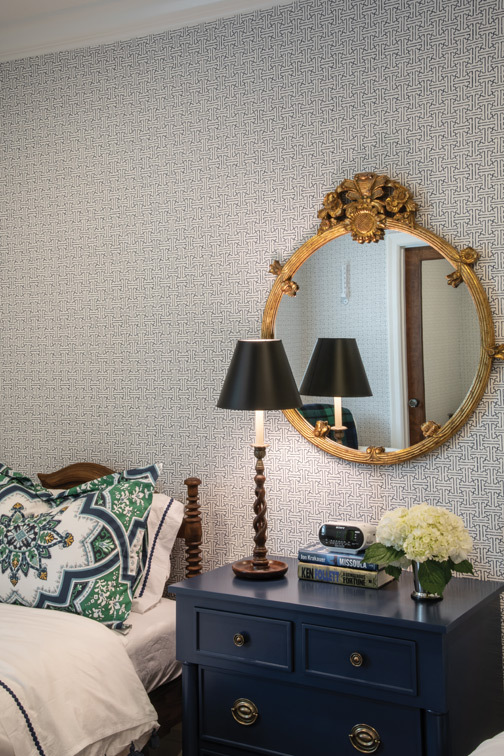 Striking wallpaper and gold decor pop in the master suite. 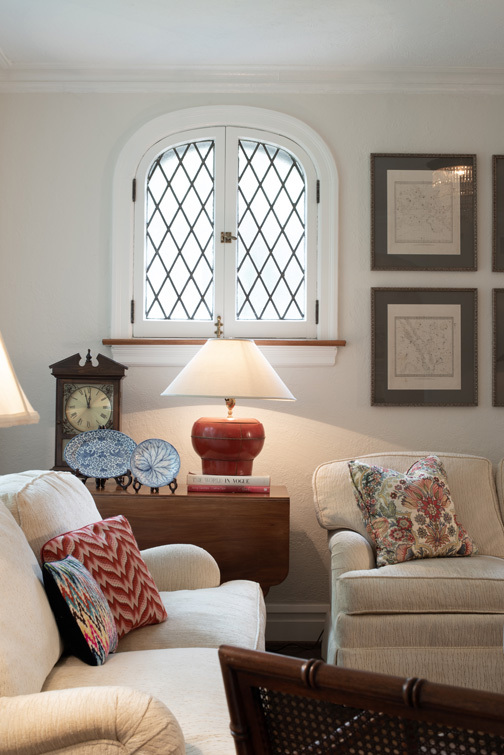 Charming windows, original to the home, find their place in a lounge at the front of the house. 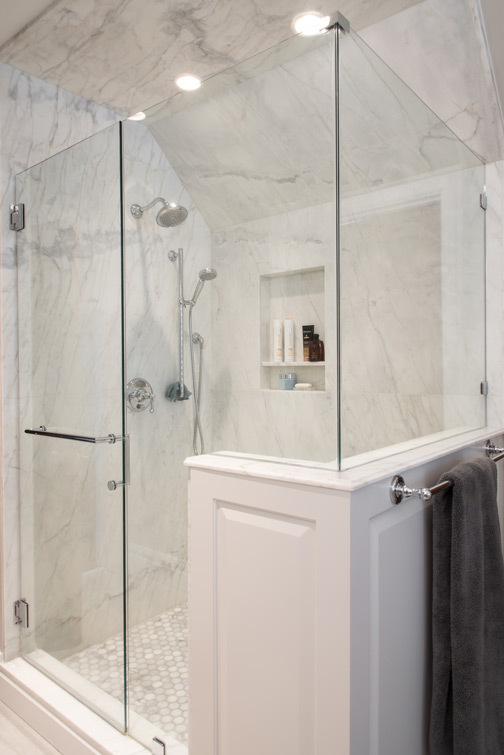 Architect Chris Marshall created a spacious new master bath over the existing garage, complete with a soaking tub, his-and-hers closets and 10-foot ceilings. Cardinal Blinds & Shutters custom fitted the blinds over the tub. But the family gradually began to outgrow the house. The small galley kitchen lacked flow and functionality and the screened-in porch begged for a higher purpose. What was once ample for a young family began to feel cramped and dark; needs and interests had changed but the house remained as it was when they first moved in. Jean says they contemplated moving out. “We could not beat this location. 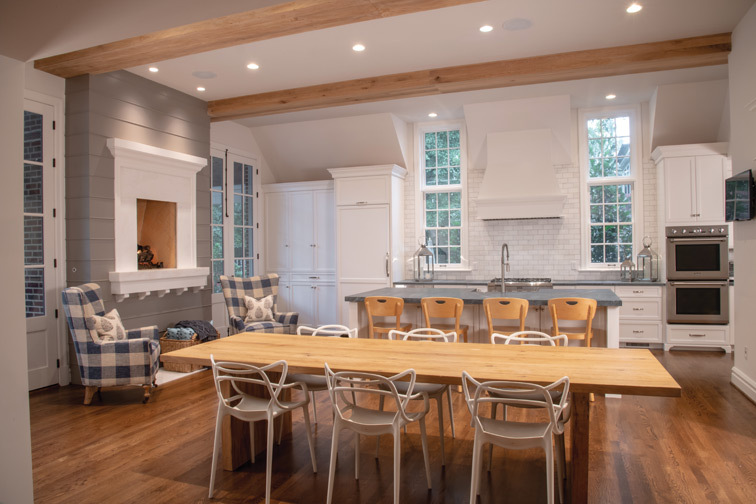 We needed stuff done to sell it, so we drew up renovations.” That responsibility fell on architect Chris Marshall, who had the heady task of coaxing the most out of the home within a stringent set of local codes. Though living space was added largely within the existing footprint of the foundation, he also bumped out the east side of the house by several feet and added a mudroom on the west side. And he repurposed. Gone was the covered porch on the east side, converted to a main-floor office for Jean, while the narrow kitchen disappeared into the family room. Jean’s former office space and back patio were absorbed into the larger kitchen and open butler’s pantry. Off the kitchen at the back of the house, a sitting area with a raised fireplace eases the transition between the kitchen and the back door leading out to the new patio. 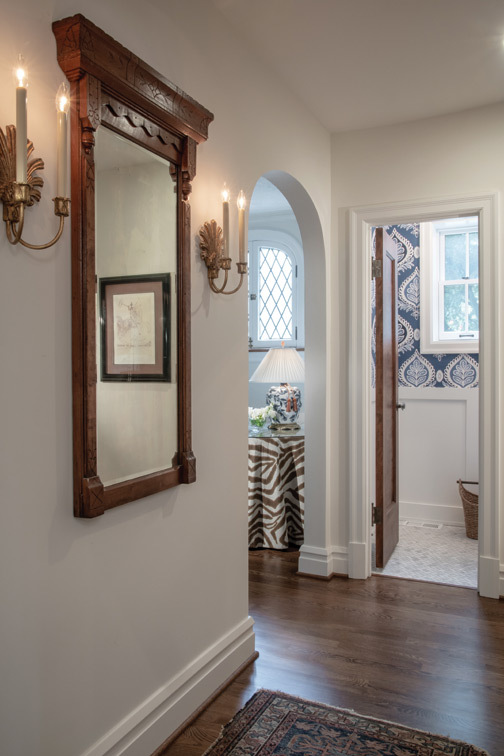 Chris worked the same magic to the second story, creating a large, en suite master bath for Jean and John over the existing attached garage, complete with 10-foot ceilings, walk-in closets and deep soaking tub. Down the hall, the couple’s teenage daughter now has a bedroom nearly twice its former size, with a bathroom and window seat where only the porch roof once sat. Even the basement expanded. Thanks to an 11-foot-deep pour, the couple’s two sons have a small hockey rink with enough clearance for the boys to don skates and knock out slap shots freely without scraping beams. The design allows for a straight sightline through most of the main floor. 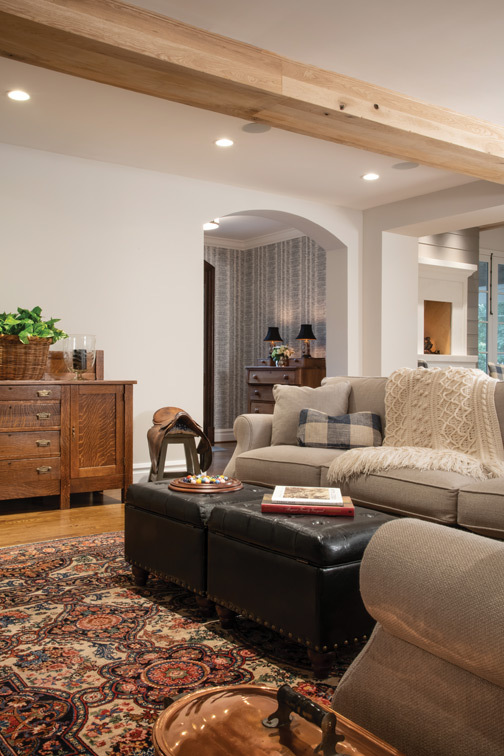 The family can view the back door and fireplace from the dining room, while Jean’s office gets light from front and back and side to side — something that was in no way possible as the home was originally laid out. The new detached garage — which houses two lifts — is large enough for four vehicles and John’s upstairs “man cave,” where the man of the house often yields the floor to visiting guests. All told, the home went from approximately 3,200 square feet of space to more than 5,000, all without sacrificing symmetry. 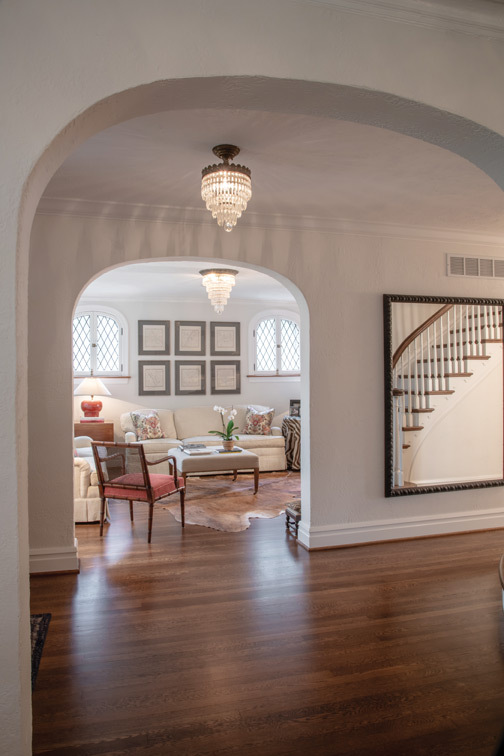 Subdued color throughout most of the house completes the sophisticated look the family was going for. 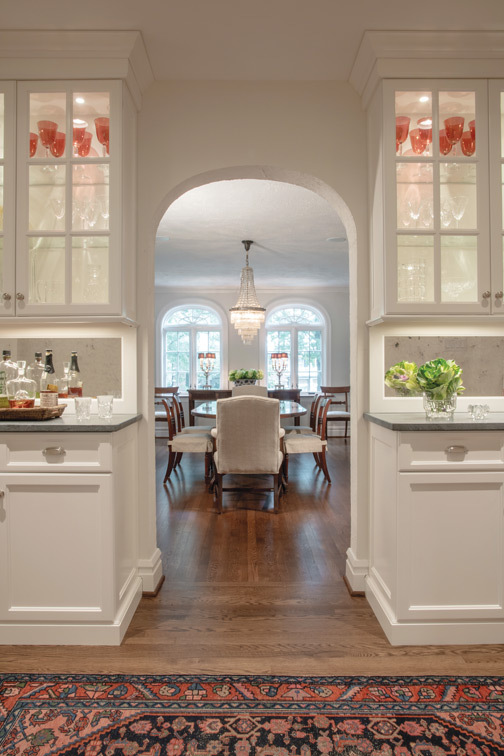 It is most notable on the ground floor, where white cabinetry and neutral walls reign. Un-oiled soapstone countertops and a light tile backsplash add interest without too much “movement,” says Jean. There are more tall windows letting in light and fewer partitions blocking the others, lending the illusion of even greater spans.